Before heading out of town this morning, we stop at Natalie's Kitchen to have one last meal with Unit and Lemon. After breakfast and snuggling session with a warm, sleepy, sweet-smelling, brown-eyed baby boy, it's time to go. Bidding the pair goodbye, we hop on our bikes for a short jaunt a few kilometers out of Savannakhet to the Friendship Bridge. As we arrive at the crossing which spans the Mekong river between sleepy rural Laos and bustling modern Thailand, I know in my heart that I'm ready to begin making the long journey home. And yet, I'm finding it a little difficult to say goodbye to this beautiful place. You've been good to us, Laos; we're going to miss you! Cars and trucks line up, idling, waiting to go through customs, waiting to cross the bridge, and we wheel around all of them, into the pedestrians' inspection area. After leaning our bikes against an official-looking building, we hand our passports over to a man in uniform, who marches them off to a nearby office. For the next twenty minutes we watch through a window as he and his friends intensely scrutinize every page of our very important documents. After what seems like an age, a different guard returns our stamped passports, and informs us that we cannot, under any circumstances, cycle across the bridge. Without skipping a beat, Tyler turns around and walks up to a truck waiting to cross the border. Knocking politely on the vehicle's door, the driver rolls down his window, and Tyler pantomimes our plight. Neither the passengers or the driver seem to understand what he is trying to convey. So, again, without a moment's hesitation, Tyler beckons our guard and asks him to translate that we need a ride. The border official looks annoyed, but begrudgingly complies to Tyler's chipper request. And so, in less than a minute, two different truck drivers have kindly agreed to ferry us and our bikes across. Meanwhile, I stand there, utterly surprised. There was a time when a predicament like this would have involved a lot of cursing or a blatant disregard for the rules. Thanks to time and experience, this phenomenon is no more. I'm still agog, when Tyler motions me over to help, and then the two of us heave his bike onto the bed of the truck. Once his bike is loaded, we do the same dance with mine on a different truck, and then we each hop in next to our bicycles to wait for the long line of vehicles to begin their crossing. After some time, our trucks start their engines and we're taken on a very short, very slow ride over the (totally safe-for-cyclists) bridge spanning the mighty Mekong. 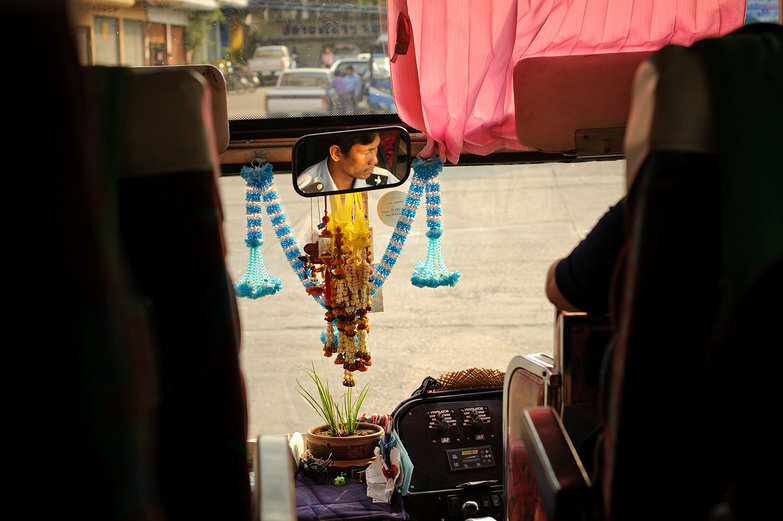 A few minutes at the Thai border, and a pair of freshly-stamped passports later, we head out, feeling a familiar sense of belonging. Returning to Thailand is easy: we know the drill, we know the food, we know how to communicate on a basic level, and we even have some Thai baht left from the last time we were here. Feeling relaxed, we cycle towards the bus station, marveling at how busy the streets are compared to Laos, a little shocked by all the people, cars, and shopping malls, of which Thailand's cousin across the river was completely devoid. 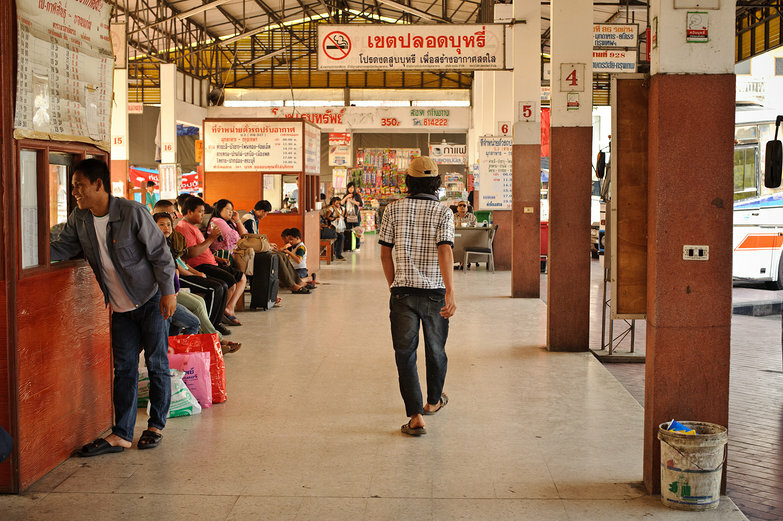 Half an hour later, we've arrived at the station; sunny afternoon light filters onto the platform as I walk up to the counter and purchase two tickets to Bangkok. Bus passes in hand, we settle into the station's coffee-shop to while away the afternoon, waiting for our ride. 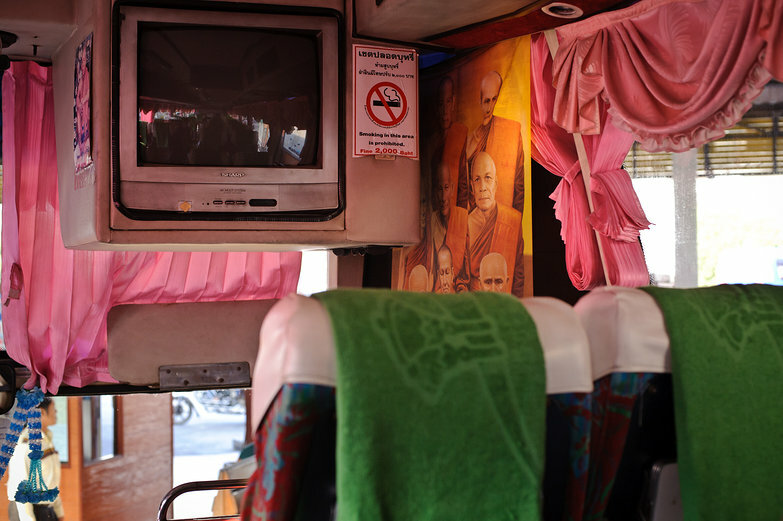 An hour later, a light blue bus, decked out in frilly pink curtains and posters of orange-clad monks, has arrived. Thanks to the help of a friendly steward, loading our things is a breeze. 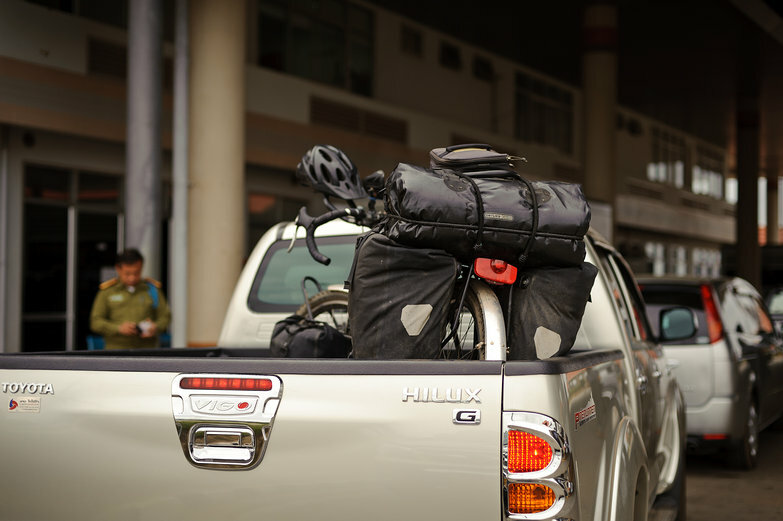 With our panniers and bikes safely stowed, we breathe a sigh of relief, thankful that this last bit of logistics has gone off without a hitch. Climbing the stairs, we squeeze through the aisle, finding a pair of seats to call our own. We rest our heads against the nubbly green terrycloth towels draped against our chairs, and we lean back, closing our eyes with a smile. Then, as the bus starts up, we roll out of the station, moving ever closer to the end of our adventure. It's dark now, and our journey is a dreamlike haze of sleep and wakefulness, interrupted by stops at stations in unknown locations, passengers clambering off and on for toilet stops and snacks. More and more people pile on at each break, and soon we're receiving glares from uniformed "flight attendants" with instructions to relinquish the towels (used as blankets) we swiped from other seatbacks so the newcomers can use them too. Then, the stern stewardesses march through the aisles, handing out snacks and drinks as if we were on a plane. Our bean-filled buns are quickly consumed, and then we drift back into a state of quasi-sleep as our bus churns through the night. It is 4AM when we arrive at Bangkok's bustling station. 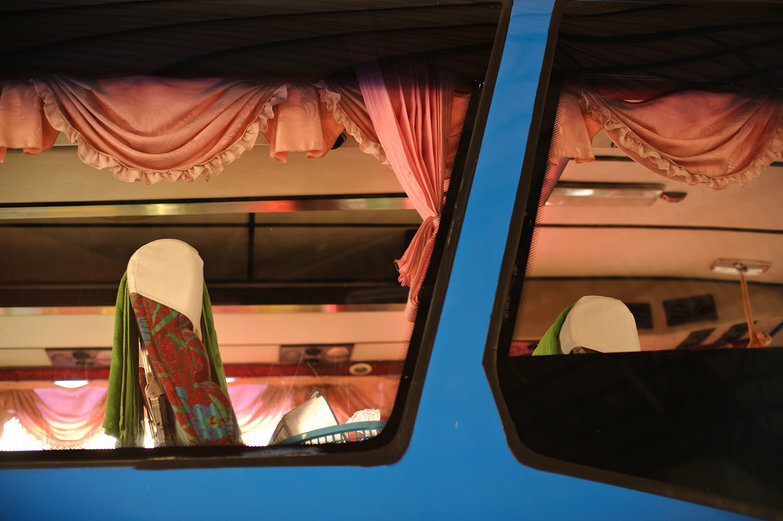 The scene is a clogged, smoggy mess of gargantuan idling buses and glaring, blinding yellow headlights. There are food stands galore, and skittering fat cockroaches that dart betwixt the luggage we've unloaded unceremoniously into a nearby walkway. In the midst of a steady stream of tourists, touts, and travelers, we reassemble our bicycles one last time, and then cycle off under our own steam, much to the dismay of numerous eager taxi and tuk-tuk drivers. The streets are quiet and cool and dark, and our minds our filled with memories: the signs, the statues, the food stalls we pass, they remind us of the very beginning of our Southeast Asian adventure. Neither of us can believe that we were in Mongolia just five months ago! Arriving at Shanti Lodge in the early morning darkness, we are pleased to find that the neighborhood feels much the same as it did the last time we were here. The same food sellers we frequented five months ago are now wheeling their carts into place for the morning. The hotel itself is dark and empty; just one woman is at the hotel when we roll up, busy preparing fruit for guests' breakfasts. There won't be any rooms available, she tells us while slicing a banana, until people begin checking out in a few hours. So, we unload our laptops and begin to work in the open-air restaurant/lobby, looking up occasionally to notice as the skies outside lighten and the street nearby comes to life with colorful food stalls. Eventually, I go buy some breakfast snacks of round, sugary doughnuts and tart fruit smoothies, bringing them all back for a picnic with Tyler. And then, when only crumbs remain, it's time to get down to business. We have stories we've been longing to tell, and eighty whole days of our trip we have yet to digest and process. 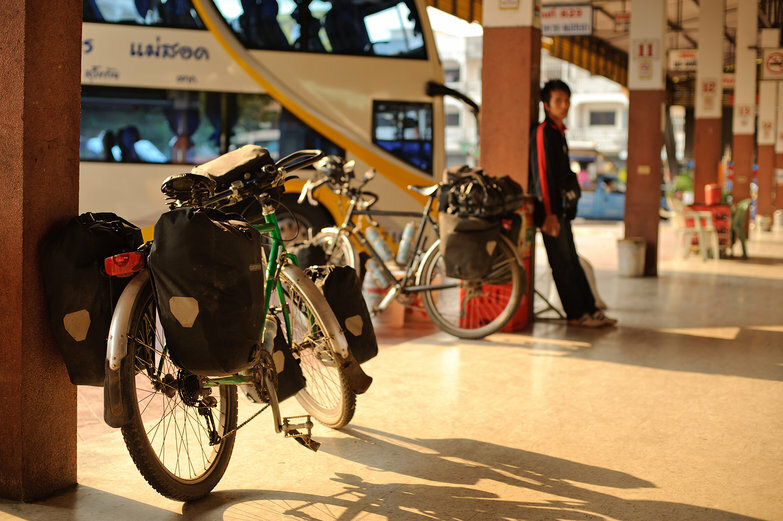 Our bicycle journey is over, and a new adventure, a two-month stationary life of writing in Bangkok is about to begin. Great fun reading about your adventures. I've crossed the Friendship Bridge 3 times now by bicycle, twice entering Laos. There is definitely a sign which says no bicycles on the Thai side, but street signs are generally ignored in Thailand so I went through with no problems and no one trying to stop me. The first time was prior to your post here and the second after. Crossing from Laos in November 2011 I actually ran into a mass of riders who were gathering at the border area for a charity bike ride to raise money for a temple in the Vientiane area. Many riders were crossing over from Nong Kai on the Thai side as well, I saw at least 30 at the border and as I cycled across the bridge entering Thailand many more were cycling and waving on the opposite side.